Zambeza crossed their Blueberry Cheese with Ruderalis to give this great-tasting Indica autoflowering qualities. The result of this is nothing but spectacular because they managed to not only keep the great taste of the original Blueberry Cheese (which by herself is a cross between a Blueberry and a White Cheese), but her potency is almost the same with a good 17% of THC. Blueberry Cheese Autoflowering is not really a big plant. Indoors, she’ll grow to a height of 40-70cm where you can expect to harvest up to a respectable 350g/m² in her short life-cycle of only 60-70 days. Outdoors, she can get a bit taller with a height of 50-100cm with yields of up to 100g per plant. Because of her compact size, Blueberry Cheese Autoflowering can make for a fantastic plant for stealth grows that won’t draw attention. You can easily hide the plant among others. Thanks to her stable genetics you can grow her anywhere without much troubles even if you’re not very experienced in growing. Blueberry Cheese Autoflowering delights with the same fantastic aroma like her feminized sister. Just take a hit and you can taste her intensive mix of flavours that wonderfully blends the berry notes from the Blueberry with nicely complimenting Cheese flavours along with some subtle musky undertones. Thanks to 17% of THC she is a very potent smoke that will give a heavy and happy Indica stone. So get ready for some deep relaxation and the big smile that she’ll put on your face! 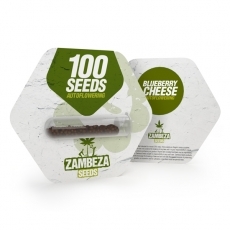 Blueberry Cheese Autoflowering by Zambeza is one of these outstanding autos that doesn’t make any compromises. For some smokers, the slightly lower THC content as compared to her sister can actually be a plus, not that 17% of THC would be weak by any means anyway. This is a highly rewarding autoflower where simply everything is right, a strain that you can’t go wrong when you grow her. For all those who want larger quantities of this great autoflowering Indica, Blueberry Cheese Autoflowering bulk seeds are available in packs of 100 seeds each.